Calling all High School Students! We are so excited to announce our annual mission trip to Navojoa, Mexico! 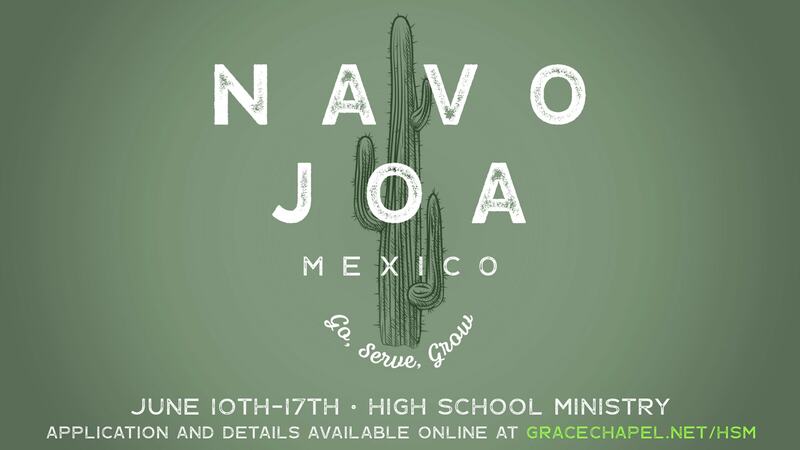 On June 10th-17th, we’ll take a group of high school students down to come alongside Grace Chapel Mexico to help them with their various needs. We are so blessed by this opportunity to be the hands and feet of Jesus! The cost of the trip is $1,450 and spots are limited. This trip tends to fill up quickly, so get your application in as soon as possible. Applications are available now down in the HSM barn! Calling all High School Students! We are so excited to announce our annual mission trip to Navojoa, Mexico! On June 10th-17th, we'll take a group of high school students down to come alongside Grace Chapel Mexico to help them with their various needs. We are so blessed by this opportunity to be the hands and feet of Jesus! The cost of the trip is $1,450 and spots are limited. This trip tends to fill up quickly, so get your application in as soon as possible. Applications are available now down in the HSM barn!